I generally appreciate and greatly profit from McGrath’s writings. His Oxford Evangelicalism always seems a bit too Anglican, but on most matters of theology he has been good. 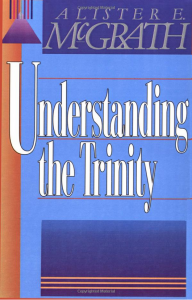 This basic book on the trinity is a book you might want to give a skeptic who is not sure whether he can believe in such an understanding of God. It is written more for the seeker than for the theologian. It is filled with helpful analogies and illustrations which sometimes slow learners need. An additional help in the book is the early chapter on atheism and the basic 20th century attacks on the Bible and theology. Especially instructive was Karl Marx’s rejection of capitalism and his subsequent antipathy toward any belief in man’s conscience and self-government. A minor negative in the book is McGrath’s failure to separate Tertullian from the modalistic teaching of Sabellianism which pictured the trinity as three masks worn by an actor.